Ask a biologist to list the main factors which cause wildlife populations to decline and most will list invasive species in the top three. An invasive species is one which is introduced to an ecosystem by humans (intentionally or by accident) and disrupts the natural order of the system. When discussing invasive species we commonly think of plants like kudzu which blankets native vegetation and kills it with shade, or the Asian carp which eats all of the vegetation in a river and thus causes the native ecosystem to collapse. Birds are frequently cited victims of invasive animal species, especially on islands like Guam, where the introduction of the brown tree snake wiped out most native avian species. But many Americans support an invasive animal species in their own yards year after year, and the effects are indeed detrimental: according to a 2009 study by Dauphine and Cooper (of the Zoological Society of London and University of Georgia respectively), one billion birds are killed each year by cats in the United States. Cats are indeed invasive; their closest wild relatives were from northern Africa but there are no native populations of our modern domesticated species. When they enter an ecosystem they can wreak havoc on the food chain due to their highly proficient hunting skills and no natural predators. Humans also often prevent cats from nature’s checks to population growth by feeding feral populations, keeping their numbers high even in the face of harsh weather and constant exposure to the elements. Not all cats are bad; when left inside a cat will kill zero native animals. 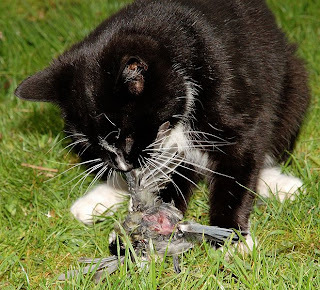 Free-ranging individuals like barn cats and “outdoor” cats can and will cause substantial damage to wildlife populations, and worst of all is the colonies of feral cats that are fed by humans. These wild individuals of the domesticated species will readily accept food from humans and occur in very high densities, causing significantly lower numbers of wild birds in the vicinity according to an article published in Conservation Biology by Soule et al. We have unfortunately noticed that there is a feral cat colony being maintained very close to our banding station at Marshall’s Indian Foothills park. We may eventually have to abandon this site – an excellent one for monitoring bird migration – if we find that cats are harming birds in our mist-nets, or stalking recently released birds. A house cat let outdoors with its most recent kill, a Chickadee. You may think that feeding cats will actually prevent damage to wildlife populations because a full cat won’t need to hunt. This is quite a misconception; nearly every owner of a free-ranging cat has been brought dead animals by their pet, and neighborhood cats stalking beneath bird feeders are a common sight. We can assume that these pets are being fed by their owners, so their hunting cannot be simply for food. Attaching a bell to your pet’s collar will not effectively eliminate depredation; the only way to prevent your cat from killing wildlife is to keep it inside. Not allowing your pet cat outdoors will also more than double its lifespan. A true animal lover will not allow their pet cats outside, for the sake of the cat or native wildlife. Feral cat colonies are hosts to many of the same issues that apply to free-ranging pet cats, only magnified. They can create pockets of dead zones where little wildlife is found, outcompete and consume native species at alarming rates, and transmit terrible diseases such as rabies and toxoplasmosis to both wildlife and humans according to The Wildlife Society. Additionally, the cats in feral colonies are frequently in poor health (although they may not show any symptoms of diseases). It is simply not ethical to support a feral cat colony, in any regard. In sum, free-ranging cats and feral cat colonies are huge issues to wildlife. We are very disturbed by the proximity of a large colony to our banding station and ask that anyone who supports outdoor cats to seriously reconsider. For more information, visit The Wildlife Society’s fact sheet at http://joomla.wildlife.org/index.php?option=com_content&task=view&id=845&Itemid=183.